A 2-wheeled walker is a walking frame with handles that one places ahead of themselves as they gradually take additional steps. A rollator walker is another type of walking frame with handles and 4 wheels, allowing one to continuously push it in front themselves as they gradually walk. tor walker is the perfect solution to give one the confidence needed to maintain a steady gait when walking. For many people, the extra support provided by a walker or rollator is very beneficial. They can greatly reduce the risk of a person falling and injuring themselves while walking independently. Wheeled walkers and rollator walkers are reliable, durable and user friendly providing a great alternative for those looking to expand mobility while adding comfort to one’s daily activities. Wheeled walkers and rollator walkers are lightweight, making it easy to lift when walking through various types of terrain. They are also foldable and enable easy storage in one’s homes. Rollators typically have mesh baskets on the front (that can be folded when not being used) for carrying personal items or small shopping bags. 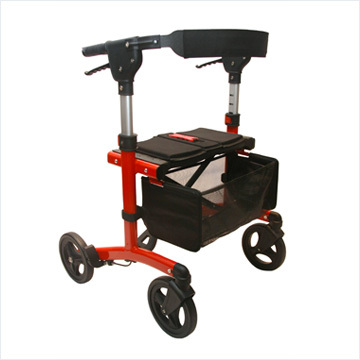 Walkers and rollators come with larger wheels for outdoor use or smaller wheels for indoor use. Walkers and rollators need to be properly fitted to account for one’s height in order to avoid more strain on knee joints and back pain. LifeCare Mobility Solutions will work with you to ensure you get the proper walker or rollator for your needs. Wheeled walkers and rollator walkers are partially funded in Ontario by the Assistive Devices Program (administered by the Ministry of Health and Long Term Care). Please contact us for more information on obtaining this funding. We can also provide recycled products when available.